Chicago is known for it's food communities, and one of my favorite food trips is a visit to Greek town. 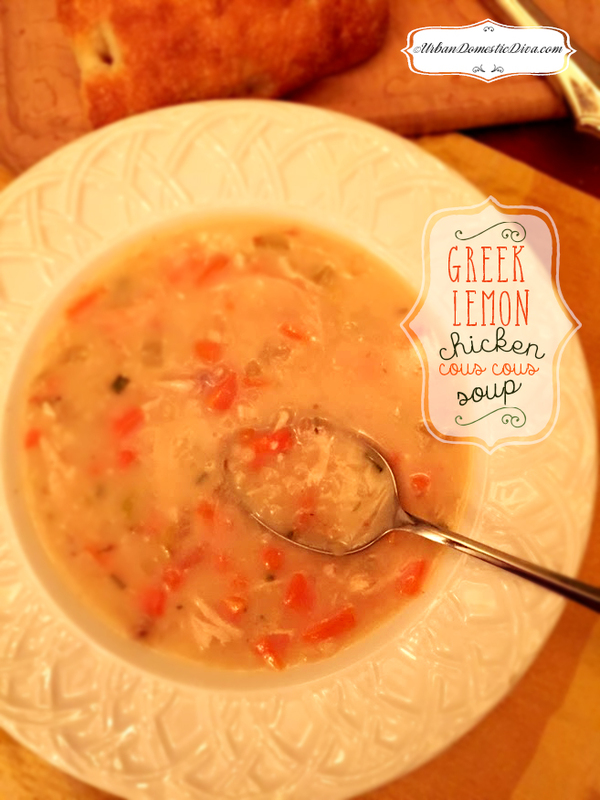 One of my favorite things to have there is a nice bowl of lemon chicken soup. Traditionally, its made with rice. My recipe uses pearl couscous-but you can also replace it with quinoa or brown rice. I adapted this recipe from 12 tomatoes, with the main change being the method of cooking. I like to brown my proteins first for a deeper flavor, and giving a fond to the base of the pan for a rich meat flavor. After browning the meat, it's nice to scrape up all the brown bits to help caramelize the vegetables at the bottom of the pan in phases, and then deglazing all of it with the chicken broth. Keep the couscous to the last 10-15 minutes of cooking. This was a delicious meal after a snow storm last week. Have some crusty bread nearby for dunking! In a large stock pot, heat the olive oil. Add the chicken breasts and brown on both sides. Transfer breasts to a platter, and into the hot stock pot add the garlic and onion. Sauté until softened, scraping up whatever brown bits you can from the chicken meat as you stir. Next add the carrots, red pepper flakes and celery. Cook for about 10 minutes, or until nice and softened. Next add the broth, scraping the bottom aggressively as you do to get all that rich flavor and caramelization into the soup. Add the bay leaves, tarragon, a sprinkling of salt and pepper to taste and bring up to a simmer. Add the chicken breasts, and partially cover the pot and simmer for about 10-15 minutes. Meanwhile whisk the cornstarch with the milk in a bowl, and set aside. When chicken is cooked through, carefully pull it out. Whisk in the milk and cornstarch mixture into the broth, and slowly bring to a simmer again. Meanwhile, shred the chicken, and add it to the soup. Add in the couscous too, and cook for another 10 minutes, or until the couscous is tender. Pull out the bay leaves, add the chives, lemon zest and juice. Give it all a nice stir and serve hot.